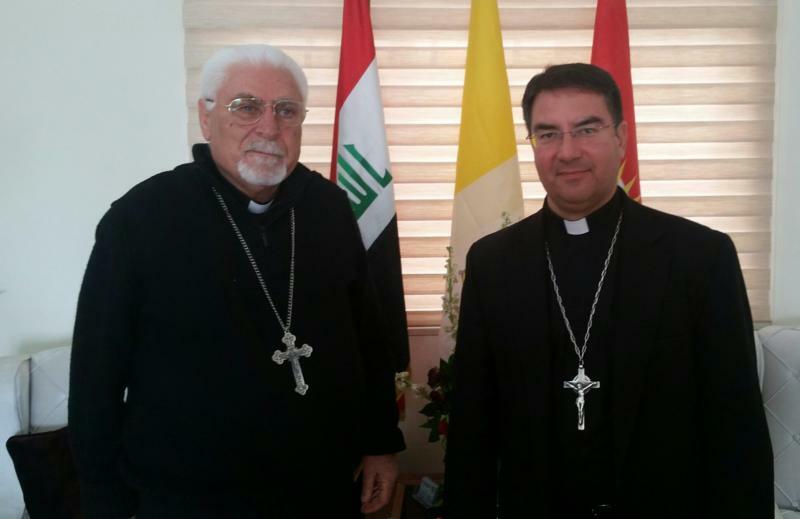 Syriac Catholic Archbishop Yohanna Moshe of Mosul, Iraq, and Bishop Oscar Cantu of Las Cruces, N.M., pose for a photo in Iraq. After meeting with church leaders in northern Iraq, a U.S. bishop said he will advocate differently for Iraqi religious minorities. Although security is paramount, they prefer to see reconciliation take place, enabling Iraq's diverse mosaic of religions and ethnicities to live side by side. But that means trust would need to be rebuilt, and that could prove tricky given the regional and local players involved in Iraq's multilayered sectarian conflict. "We don't want to live in a ghetto. That is counterproductive. That makes us a target for our enemies. We have to live in a secure but integrated community where Chaldean Catholics, Syriac Catholics, Sunni Muslims, etc., have relationships with each other," Bishop Cantu told CNS, recounting the remarks made by Syriac Catholic Archbishop Yohanna Moshe of Mosul, Iraq. He said the archbishop told him: "We need an integrated reality, rather than a 'Gaza' where there's a wall and someone is guarding people going in and out." Bishop Cantu chairs the U.S. bishops' Committee on International Justice and Peace. In that capacity, he led a small delegation on Jan. 11-13 to see and hear Christian perspectives in the aftermath of the Islamic State assault in 2014 and the current U.S.-led coalition's battle to flush out the militants. Catholic clergy "really want to establish some normalcy in the midst of displacement," Bishop Cantu said. He said he was amazed by the speed which Chaldean Catholic Archbishop Bashar Warda of Irbil has started a Catholic university to provide education and direction to the youth. Archbishop Warda also has restored personal dignity by moving displaced Christians from camps into homes with a rent assistance program. Still, "there is a reality of the wounds created by the neighbors who turned on neighbors," said Bishop Cantu. He was told that after Christians went back to check on their properties following the liberation from Islamic State, in some instances, "neighbors went in, looted and later burned their homes." The terrifying escape from Mosul for a number of Dominican Sisters has left a profound "sadness in their eyes and voices that question what's the best for these Christians," Bishop Cantu said, "whether it is to stay in the midst of anguish and terror or seek safety and security elsewhere in the world." The displaced Dominicans have been helping other displaced Christians with shelter, provisions and most recently, by setting up and running a school. "I was so taken by their commitment to stay as long as there are Christians in Iraq," Bishop Cantu said. Both Bishop Cantu and Stephen Colecchi, director of the U.S. bishops' Office of International Justice and Peace, made a similar visit to northern Iraq two years ago. This time they were also joined by Bill O'Keefe, vice president for government relations and advocacy at Catholic Relief Services. O'Keefe told CNS that, after speaking with internally displaced Christians in Iraq, he realizes the immense challenges they face. "The physical damage to their traditional Christian villages is severe, and security and trust aren't present to make them comfortable in going back," O'Keefe said. "They need to have their security and their full human rights respected to be able to return." He said it's not clear how that will be accomplished. However, O'Keefe said it was "the responsibility of the central Iraqi state, the Kurdish government (in the north), and other players involved to come up with a vision where minority rights are respected and adequate security is provided." O'Keefe felt there was a "bit of a lost hope as the Christians have to grapple with the vulnerability they find themselves in." Although he said CRS is looking very seriously at rebuilding in the next phase, the message the delegation got from Iraqi Christians is that "rebuilding needs to follow security." "They weren't ready yet to talk about specific plans for rebuilding. Rather they need to know how safety and security will be provided, which would allow them to stay," O'Keefe said. "That's the first problem which needs to be solved and it's inherently a political one." To that end, Colecchi said the U.S. bishops' Office of International Justice and Peace in Washington will advocate for the U.S. government to do a "much better job of working with all the political entities in the region to come up political solution to create an inclusive Iraq." "Rights are based on citizenship, the rule of law, equal protection, and where towns and villages have good degree of self-rule so they can shape their own destiny and have a real voice in decisions and more immediately impact their community," Colecchi said. "That's how you create protection." Both Archbishops Moshe and Warda seek Washington's help to build local institutions, train police forces, and the judiciary, Colecchi said. But the primary need is to create the rule of law and citizen rights. Archbishop Warda welcomed last year's resolution by the U.S. Congress declaring that Islamic State has committed genocide against minorities in Iraq and Syria, Colecchi said. He said the archbishop felt the resolution would focus the world's attention on the horror as well as force Iraqis to acknowledge that genocide has taken place and to make sure it will not happen again.